Lower Hutt from the air, looking eastwards. It is New Zealand's seventh most populous city, with a population of 101,700. The city covers an area of 377 km2 (146 sq mi) around the lower half of the Hutt Valley and the eastern shores of Wellington Harbour. It is separated from Wellington proper by the harbour, and from Upper Hutt by the Taitā Gorge. Though it is administered by the Hutt City Council, neither the New Zealand Geographic Board nor the Local Government Act recognise the name Hutt City. This name has led to confusion, as Upper Hutt is administered by a separate city council, the Upper Hutt City Council, which objects to the name "Hutt City". Prior to European settlement, thick forest covered most of the Hutt Valley, with areas of marshland close to the river's mouth. Māori inhabited the shoreline, with a pa at each end of Petone beach. The local Māori welcomed the arrival of the New Zealand Company ship Tory in 1839, and William Wakefield (the company's agent) negotiated with local chiefs to allow settlement. The first immigrant ship, the Aurora, arrived on 22 January 1840, still celebrated every year on the Monday closest as Wellington's Anniversary Day. A settlement, Britannia, grew up close to the mouth of the Hutt River, and settlers set up the infant country's first newspaper and bank. The city takes its name from the river, named after the founding member, director and chairman of the New Zealand Company, Sir William Hutt. Christ Church, Taitā, built in 1853 is the oldest church in the Wellington region. Within months of settlement the river flooded, and in March 1840 the majority of Britannia settlers decided to move to Thorndon, (as of 2013 in the heart of Wellington city), though some settlers remained at the north end of the harbour. In the 1840s an area on the west bank of the Hutt River formed the village then known as Aglionby. In 1846 conflict arose between settlers and Māori, which led to skirmishes. In 1855 a major earthquake raised part of the lower valley, allowing the reclamation of land from swamp. On New Year’s Day 1859 the first permanent lighthouse to be built in New Zealand was lit at Pencarrow Head, and was home to New Zealand’s only female lighthouse keeper, Mary Jane Bennett, was the inaugural operator of the lighthouse. The railway line from central Wellington reached Lower Hutt station (now Western Hutt) in April 1874, with the line travelling north up the west side of the river to Silverstream opening two years later. Before the Second World War, urban settlement in the lower Hutt Valley concentrated mainly on Petone, central Lower Hutt and Eastbourne, with a total population of 30,000. In 1927 the Public Works Department completed the construction of a branch railway line to Waterloo on the east side of the river; the route diverging from the main line between Lower Hutt and Petone. Two years later the railway workshops moved from Petone to a new larger site off the new branch at Woburn. In the late 1940s new suburbs of state housing developed along the eastern side of the Hutt Valley, from Waiwhetu to Taita, to alleviate nationwide housing shortages and to cater for the booming population. Between 1946 and 1954, the railway line from Waterloo was extended through these new suburbs to Haywards, becoming the main line in 1954 when the existing main line was closed between Haywards and Melling. By the end of the 1950s, Lower Hutt had a population of 80,000. The Hutt City Council is made up of a mayor and twelve councillors. Ray Wallace was elected Hutt City mayor in 2010, succeeding David Ogden. The city's six electoral wards (Northern, Western, Central, Eastern, Harbour and Wainuiomata) each elect two councillors. Neighbouring councils are Wellington City Council (adjoining to the north-west), Porirua City Council to the north, Upper Hutt City Council to the north-east and South Wairarapa District Council to the east. The boundaries of the Hutt City local body have evolved from a series of amalgamations and boundary changes over the years. The Hutt County Council was established in 1877 and covered the region from Wellington's south coast up to Waikanae, excluding the Wellington City Council area. As the region grew, urban parts of the Hutt county became autonomous boroughs: Petone in 1888, Lower Hutt in 1891, Eastbourne in 1906, Johnsonville in 1908, Upper Hutt in 1908, Porirua in 1962 and Kapiti in 1974. In 1941 Lower Hutt became a city. It incorporated Normandale in 1957. In 1987/1989 the New Zealand Government forced local authorities to consolidate, which led to Lower Hutt amalgamating with the adjacent Boroughs of Petone and Eastbourne and with the Wainuiomata District (which had its independence for barely a year), and to the abolition of the Hutt County Council. The city centres on the lower (southern) valley of the Hutt River, to the northeast of Wellington. The valley widens as the river nears its mouth, so the central urban area of the city forms a triangle with its longest side along the shoreline. In the upper reaches of the city the Western and Eastern Hutt Hills become closer, culminating in the Taitā Gorge at the northern end of Lower Hutt, separating the city from neighbouring Upper Hutt. Lower Hutt includes the cluster of small settlements that extend down the eastern coast of Wellington Harbour. These include the two large townships of Wainuiomata (inland) and Eastbourne (on the coast). The city also includes a large area of sparsely-populated land to the east of the harbour, extending to Pencarrow Head and into the Rimutaka Ranges. Lower Hutt includes the islands in Wellington Harbour, the largest of which, Matiu/Somes Island, is commonly referred to by its former name of Somes Island. Was originally named Heretaunga and now known as Awakairangi / Hutt River which in Maori means river of food from the sky. Lower Hutt occupies the lower regions of the flood plain of the Hutt River, and the river is one of the most significant features of the city. In the 20th century stopbanks were built to contain the river, but the threat of flooding from heavy rainfall persists. In 1985 the river burst its banks, and since then floods have been on a smaller scale. Smaller streams and storm-water drains have also caused occasional problems when rainfall exceeds average levels. Much of the land adjacent to the river is protected as reserve and provides a popular recreational area, with walking and cycling trails and grassed areas along both sides of the river up the Hutt Valley. With lower river levels in mid-summer, algal blooms have contributed to making slow flowing areas anoxic. The algal blooms have been attributed as the cause of death of a smal number of dogs swimming in the river as well as skin reactions in the case of swimmers. The river is crossed by seven bridges within the city, and have seen many times that built and replaced since the 1850s. Suburbs of Lower Hutt listed approximately north to south. Those in italics are unofficial suburbs. Historically, Petone, Seaview and Gracefield have been the main area for industry in the Wellington region, with industries including meat processing and freezing, motor vehicle assembly, and timber processing. As business have taken advantage of global manufacturing efficiencies, much of this large scale industry has changed to smaller design-led and medium sized industries exporting to the world. Over the past 25 years service, distribution, and consumer-oriented sectors have increased. Lower Hutt remains the main location for light industrial activity in the Wellington Region. Petone's Jackson Street and neighbouring areas have seen a resurgence in to one of Wellington's most popular retail and hospitality area. Lower Hutt has one of the greatest proportion of science, technology and high value manufacturing businesses in New Zealand. Cutting edge Crown Research Institutes such as GNS Science and business accelerator Callagahan Innovation Ltd are based in Loewr Hutt along with over 800 research organisations in high-end manufacturing, research and technology. The suburb of Avalon was home to New Zealand's television industry from 1975 until the late 1980s. The Avalon Television Studios were New Zealand's first purpose-built television studios, and is the largest television studio complex in New Zealand and Australasia. The studios were home to Television One from 1975 to 1980, when it merged with South Pacific Television to form Television New Zealand (TVNZ). After 1989 most of TVNZ's operations moved to Auckland, and the studios were eventually sold off in 2012 to a consortium of Wellington investors. Avalon continues to operate independently with seven film and television studios used as primarily as a feature film production base. A large proportion of Lower Hutt's residents commute to the mainly commercial and Government offices in Wellington City 12 km to the south-west. The Civil Aviation Authority of New Zealand (CAA) has its headquarters in Aviation House in Petone, Lower Hutt. The city possesses civic administration buildings constructed in the 1950s that are regarded as representative architecture of the era. A building of national significance is Vogel House, a two-storey wooden residence that was the official residence of the Prime Minister of New Zealand for much of the 20th century. It is a prime example of early colonial architecture in New Zealand and operates today as a tourist attraction. The city is popular for outdoor sports, especially mountain biking, hiking, recreational walking and fishing. The central city is home to Westfield Queensgate, a large shopping centre. The Riverbank car park adjacent to the central city is home to a Saturday market from 8am to 2pm. This market is a one stop shopping experience for fruit, vegetables, meat, fish, and breads. There are also arts and crafts stalls and a broad range of food vendors for a tasty lunch. Among the filming locations for The Lord of the Rings film trilogy directed by Peter Jackson, Dry Creek quarry, which dominates the hills above the suburb of Taitā, became the site for a huge medieval castle built for scenes of Helm's Deep and Minas Tirith. Lower Hutt has four state secondary schools: Taita College, Naenae College, Hutt Valley High School (the largest) and Wainuiomata High School. Other secondary schools include Chilton Saint James School, a private girls school; Raphael House Rudolf Steiner School, a state integrated Waldorf education school; Sacred Heart College, a state integrated Catholic girls school; St Bernard's College, a state integrated Catholic boys school; and St Oran's College, a state integrated Presbyterian girls school. The city is home to two tertiary institutes: the Wellington Institute of Technology in Petone, and The Open Polytechnic of New Zealand in Waterloo. Hills to about 350 m (1000 ft) line both sides of the valley within the city limits. The western hills have been populated as residential areas, but the eastern side is protected and clad in native bush and scrub, and the ubiquitous gorse in areas that have been cleared as a result of scrub fires or earlier human activity. Native birds are common, including the New Zealand pigeon, tui, grey fantail, silvereye, shining cuckoo (in season), grey warbler and morepork. Introduced species include the common blackbird, song thrush, house sparrow, European goldfinch, common chaffinch, common starling, and Australian magpie. Tempe was the first Sister City, in 1981; Minoh City in 1995; Xi'an since 2000; Taizhou formalised the agreement in 2008; and Laredo the most recent, in 2011. Lower Hutt from Normandale, in the western hills. On the right is the entrance to Wellington Harbour, with Matiu/Somes Island beneath. The Hutt River snakes from the right background to the left mid-ground, entering the harbour between the suburbs of Seaview and Petone. The Wainuiomata Hill Road climbs the hills in the centre background (the track in the middle of the left half of the background is a firebreak, not a road). At the foot of the Wainuiomata Hill Road is the Gracefield industrial area. Wider view of the Lower Hutt valley. This view shows Wellington in the distance on the extreme right hand side. 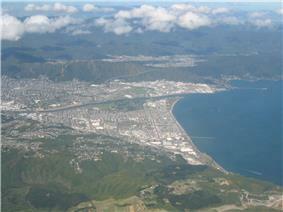 Past the Lower Hutt CBD in the centre of the photo, and onto Avalon and Taitā on the left-hand side. Wellington Harbour and southern Lower Hutt from the top of the Wainuiomata Hill Road (south of the above photo), looking west. Matiu/Somes Island is in the harbour on the left (South), and beyond that the row of lights along State Highway 2, marking the line of the geologic fault, both of which continue up the far side of the valley to the right. The industrial area in the central foreground is Gracefield. In the distance, behind Matiu/Somes Island, are Wellington port and CBD. ^ a b "Subnational Population Estimates: At 30 June 2014 (provisional)". ^ "Climate Statistics for Lower Hutt, NZ (1985–2010)". Retrieved 27 January 2012. 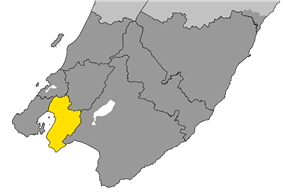 ^ "Hutt City Wards and Suburbs". Hutt City Council. Retrieved 25 August 2013. ^ Tom Hunt and Paul Easton (11 April 2011). "The rise and fall of Avalon". ^ "Contacting the CAA." Civil Aviation Authority of New Zealand. Retrieved on 28 September 2010.